Unity U-7682 Clear replacement spot Lamp fits model S6, 325-380 and S04 spotlights and rooflights. 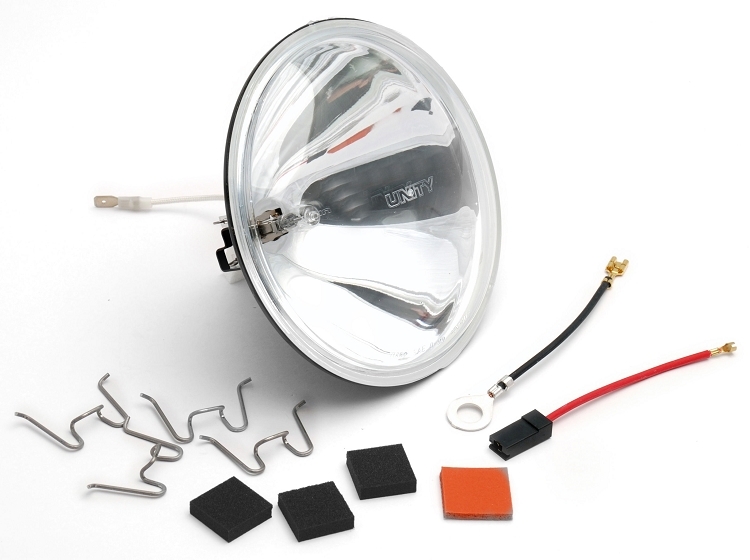 Each kit includes halogen composite lamp assembly with bulb, wire adapters and spacers. Rated at 12 volts, 100 watts, 245,000 CP, 100 hours lamp life. I replaced the old light bulb unit because water had gotten into the lighting area and rusted a good amount of the bulbs frame. When I took the old bulb out, it fell apart. I contacted Unity and I was advised of the parts kit I needed, ordered the item and installed it and everything works perfectly. Purchased item as a spare. Items previously purchsed have performed well. Needed the kit to repair a spot light on a newly acquired company vehicle. Was delivered within a week of ordering. Only took a few minutes to install. Quality Of parts is very good. Instructions explained and showed anything in question. I received my order quite promptly , even though this was your vacation week. The packing dept. did a fabulous job, double boxing was the way to go ! Extremely easy to switch out the assembly . Now my Unity spotlight works like a charm. I personally thank you and your team . Good work ! Q: Hello. How do I know which replacement light bulb is the correct match for my spotlight? I have a 2003 Ford Crown Victoria P.I. Thank you for any suggestions. A: Replacement bulb would be U-H3-100W. For whole replacement lamp assembly use U-7682. Q: I just bought a 2002 crown vic police interceptor and the spotlight bulb is burnt out. would this item be a proper fit? if no how would I go about finding the required information? A: If it was factory installed and is marked Model 325-380, then it is the correct one. Q: Model S04 - after screw removed, how does bezel come off for bulb replacement? twist? spring? pry? A: The ring/bezel of a model S04 spotlight twists off, like the lid of a jar, after the screw has been removed. Q: How do you install replacement lamp using the springs? Q: shipping price to fla? A: Depends on items ordered, how many of each items, type of shipping, and specific location shipped to. Q: Is this a direct replacement for the old part 8172CAV.1? A: 8172CAV.1 is a production code and not related to the part number. I believe that code is used only on Model S04 shell (the model number would be on the back of the shell on the outside near where the shell connect to the rest of the spotlight.) If the shell is an S04, this lamp will work in it for spotlight applications. We also now have U-8547 LED Lamp that will also work in S04 shell. Q: will this lens fit on a S04 model since we can't find a lens? Is there just a lens available for purchase? A: This is the correct replacement halogen lamp for model S04 spotlight. It is only available as the full lamp assembly. Q: I have a number of these spotlights on my one year old Police Vehicles. I have two with lens cracks. I can't tell if they are from road hasard stone throws or something else. We rarely drive on highway so I can't imagine what has impacted them to cause a crack. is this an ongoing problem and what part number do I need to replace them? A: Cracking without an external cause is not a common issue. Cracking is normally caused by something hitting the light, like a rock on the road or vandalism. Sometimes extremes in temperature, and certain chemical cleaners can also cause a crack. Replacement part number is U-7682. A: The lens is only available in the full U-7682 assembly. Q: what is the diameter? need 5 in.